After having spent the weekend in Melbourne (post to come) my son has been telling me about this thing called the Melbourne Shuffle. As I’m sometimes a dreadful listener when it comes to him because he talks so non-stop a lot of the time it took a while for it to sink in. This morning he asked if I could Google ‘Melbourne Shuffle’ to find a video of it. Google it I did and found a whole new (to me) dance style I’d never ever heard of. It’s been around since the late 1980s and as the name suggests it’s from Melbourne. JJ informed me that one of the guys used his hands too much. You see he’s such an expert now. I told him to learn it himself. He could use the back room floor as his dance floor as apparently the dancing surface needs to be a bit slippery for the shuffle to work. Had you heard of the Melbourne Shuffle before? 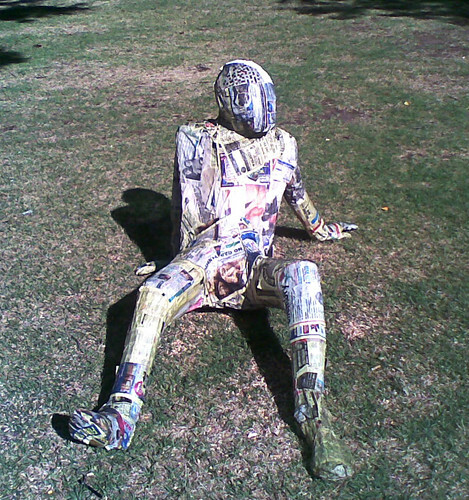 I had to go a slightly different way to work the other morning and saw this chap sitting down enjoying the sunshine. I had to look twice because it felt like someone had forgotten to take him home. There was a period during the winter where I hardly had any social occasions lined up and now they’re all happening at once – well sort of. The next four weekends have something on and then it’s school holidays for six weeks. Plus there’s a heatwave happening here at present. Spring slipped buy without barely a sigh and we went straight from fairly cool weather to quite hot weather. I’m glad we have seasons as I would get sick of it being hot all the time or cold all the time and each season brings its own good things. Summer means longer daylight hours which I like and I can spend time outside watering the garden or at least seeing whereabouts the dog poo is to pick up. In winter it’s dark when I get home and the garden is sadly neglected to allow all the weeds to flourish. Summer also means swims at the beach. 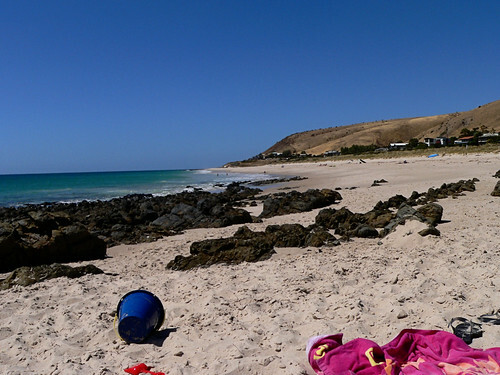 I had a wonderful evening last weekend with friends having a swim then tucking into a fantastic picnic on the beach. All of us took a plate of food to share and all the dishes complemented each other perfectly. The sea water is still slightly cool but by the end of this week it should be pretty good so I’ll have to head to the beach again I think. Unfortunately summer and its hot days also mean hot nights and for me the last few nights a serious lack of sleep. I was pacing the house last night around midnight having gone to bed two hours earlier but unable to get to sleep. I awoke at 5am and was seriously tired all morning at work before I slipped into a sort of a lull that got me through the rest of the afternoon. I think I did say some things that didn’t make any sense at all because of a delirious lack of sleep but tonight’s another night and I’d better catch up otherwise it won’t be pretty. My mind’s on lots of things too which probably doesn’t help the sleep factor. I’m helping organise a large annual event that a group of friends and I put on once a year and this year I’m the ticket seller so that’s taken up some of my time. I’m also going away next weekend sans child but he’s staying nearly three hours away so I’m trying to work out logistics of that. It doesn’t really seem to ever slow down around here – another reason for me to look forward to my upcoming six weeks off. Oh, and I’m also doing the Wardrobe Challenge and you get a chance to win a $50 EziBuy voucher to buy some clothes of your own. Below is a post I wrote for the Aussie Bloggers blog back in June 2008. As Aussie Bloggers is now pretty much defunct and once the domain runs out the content will be lost in the ether I gather so I wanted to get some of the content I wrote and put it on this website. I was interested to note that out of the top five Top 100 Aussie blogs, two of these are photography blogs. Also interesting to note is that these two photography blogs are ‘how to’ blogs. The blogs are Digital Photography School and Photoshop Tutorials and Links. While the latter is about Photoshop, it does mainly deal with editing photos. It got me thinking as to why blogs about photography and editing photography are so popular. I wonder if it’s as simple as there are more photographers than bloggers out there. I know since I got a Flickr account I’ve become more involved in the Flickr community with meeting real people and taking photos with them. Consequently I’ve created a new category on my blog called photos because I’m developing a real interest and enjoyment in it. Of course digital cameras make a huge difference. If we had to take photos with film, get it developed then scanned to a digital format I’ll bet lots of people wouldn’t bother. So you’ve learned about taking photos and how to edit them afterwards, but now you want to incorporate them into a portfolio and blogging is the perfect way to do this. A blog I’ve been reading for a while is Boudist. Daniel Boud – the author – has had a great journey of a photography hobby becoming an interesting job. Read about it. Another Aussie photo blog I came across relatively recently is Neil Creek – Photographer. He also writes for the aforementioned Digital Photography School and runs photography competitions. 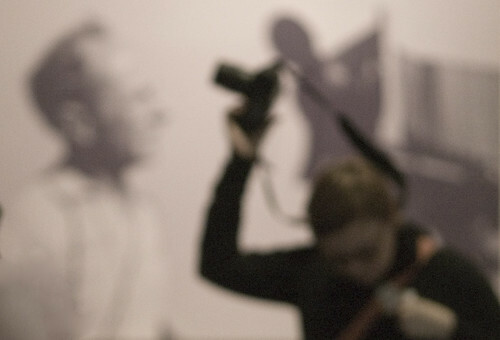 What other blogs that focus mainly on photography do you read – particularly Australian ones? The other day saw me wearing a lovely green summer trench coat. This time I’m wearing one of my favourite clothing items – the cardigan. I love a cardigan – as I’m sure I’ve said here before. I love the colour of this one too. It’s the Capture 3/4 sleeve cotton cardigan in Bluebell accompanied by the Capture Ruffle Tank. 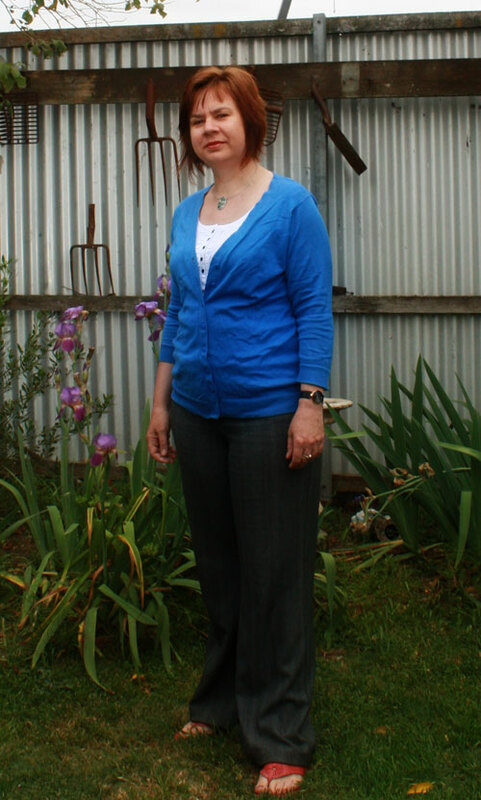 The trousers are an op shop purchase but originally from Witchery. Anyway I’m not going to keep these goodies all to myself. You have a chance of winning a $50 EziBuy voucher to spend at their website. All you have to do is leave a comment here saying what your essential summer style from the Wardrobe Challenge’s website is and how you would use an item from there to style with what you already have. You also have the chance to win $1000. Creativeness will win out here so if you want to share photos of your unique style please do so and link back to this post and that will also count as an entry. Anyway, the competition closes in just over two weeks, at midnight on Sunday 22 November and is open to Australian residents only. Here’s another combination. This time wearing the Capture Ruffle Tank I’m wearing above. 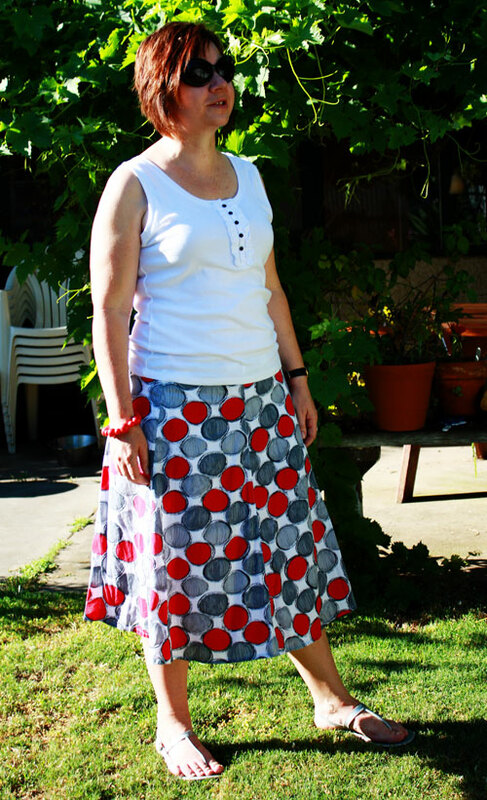 I’m also wearing a skirt I bought at the op-shop and the sandles are from the same op-shop. Last week it was a bit cool but this week has seen a heatwave settle in so no cardigans or trench jackets in sight. The heatwave was followed by cooler weather and some rain and it’s back to spring again. 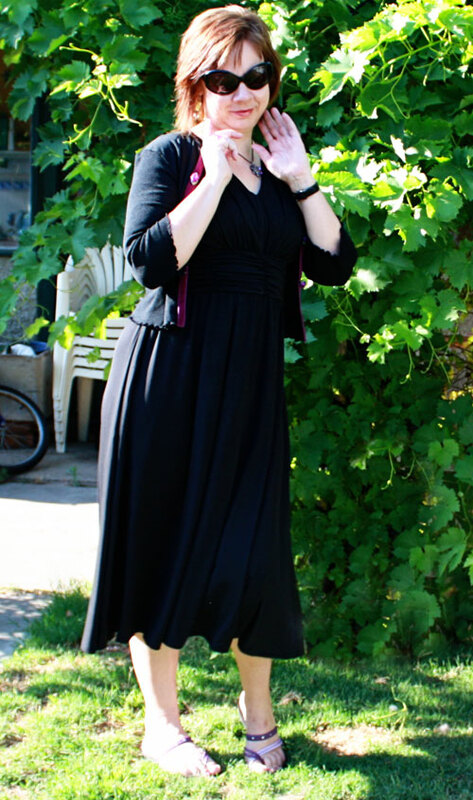 The dress below is an EziBuy Capture black goddess dress worn with a cardigan of mine. My son took a bunch of photos for me and he’s a natural people photographer getting me to work it for the camera. Yes, my weakness is clothes. I love to buy them and I love to wear them and I love a bargain, and I love free clothes. Do you have a wardrobe full of stuff but only wear 20% of it? Sound familiar? I’m taking the Wardrobe Challenge and thought you might like to as well. Go and read about it over here.